Every week we pull together some great recipes from Canadian food bloggers around the web featuring one main ingredient or dish. This week, it's a full on pizza party! 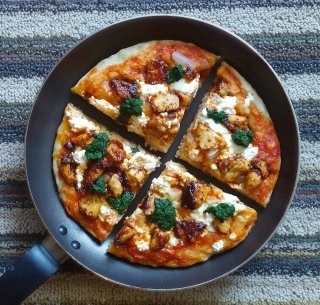 Our members came to the table with some of their best, most creative pizza recipes that you can try at home. Some are gluten free, some are great for breakfast, there are even a few dessert pizza ideas hiding amongst these posts. Start off with a great crust recipe or get creative with your crusts with lentils, polenta or even mushrooms. And while pepperoni is a classic topping, don't be afraid to go a little crazy with whatever's in season! Start with the basics - this **[step by step homemade thin pizza crust recipe](http://www.beyondumami.com/2013/07/my-homemade-thin-pizza-crust-recipe.html?m=1)** from **Beyond Umami**. **[Tempered Pumpkin Naan Pizza](http://www.choperella.com/recipes/tempered-pumpkin-naan-pizza/)** from **Choperella**. [Amazing Carbless Carbonara Pizza](http://pickytoplenty.com/2015/04/21/carbless-pizza-carbonara/) (the cruse is **not** made from Cauliflower) from **Picky to Plenty**. [A trio of BBQ pizzas](http://www.sugarlovespices.com/another-bbq-pizza-night/), including one for dessert from **Sugar, Love, Spices**. **[Gluten Free Lentil Pizza Crusts](http://thecookiewriter.com/lentil-pizza-crusts/)** from **The Cookie Writer**. **[Pretzel Crust Pizza](http://www.thereciperebel.com/pretzel-crust-pizza/)** from **The Recipe Rebel**. **[Spring Pizza](http://howtoeat.ca/how-to-quickie-meal-spring-pizza/)** from **How to Eat**. **[Cartelized Pear & Prosciutto Pizza](http://www.rockrecipes.com/caramelized-pear-and-prosciutto-pizza/)** from **Rock Recipes**. **[Chorizo Manchego Pizza](http://www.seasonsandsuppers.ca/chorizo-manchego-pizza/)** from **Seasons & Suppers**. **[A Pizza Party](http://www.mangiabedda.com/pizza-party/)** with everything from the dough recipe to lots of topping ideas from **Mangia Bedda**. **[Easy Sausage and Egg Tortilla Breakfast Pizza](http://merryabouttown.com/breakfast_pizza_recipe/)** from **Merry About Town**. **[Caprese Pita Pizzas](http://www.thesaltyalmond.net/recipes/caprese-pita-pizzas)** from **The Salty Almond**. **[Mushroom Crust Pizza](http://jitterycook.com/2015/04/24/mushroom-crust-pizza-for-special-guests/)** from Jittery Cook. A big thank you to all our FBC Members who participated in this weekend's pizza recipe roundup. 8 Chances to Win a Copy of Batch by Well Preserved! so are we… when I asked for interesting I had no idea the creativity that would pop out. I was only sorry I couldn’t include everyone!